This fact has become more difficult to demonstrate recently as so many people have been put on statins that the association between cholesterol levels and mortality has been twisted, bent and pumelled into the weirdest shapes imaginable. However, Japan, provides some very interesting data. Japan has always had a very low rate of heart disease, an enviable life expectancy, and… generally low cholesterol levels. Aha!, surely this means that low cholesterol levels are good for you? Well…. All-cause mortality is the most appropriate outcome to use when investigating risk factors for life threatening disease. Section 1 discusses all-cause mortality according to cholesterol levels, as determined by large epidemiological studies in Japan. Overall, an inverse trend is found between all-cause mortality and total (or low density lipoprotein [LDL]) cholesterol levels: mortality is highest in the lowest cholesterol group without exception. If limited to elderly people, this trend is universal. As discussed in Section 2, elderly people with the highest cholesterol levels have the highest survival rates irrespective of where they live in the world. I don’t think that I really need to say anything else, other than to repeat this fact. If you have a high cholesterol (LDL) level, you will live longer. This is especially true of the elderly. This entry was posted in Cardiovascular Disease, Cholesterol & Statins on May 18, 2015 by Dr. Malcolm Kendrick. Woo hoo, woo hoo. Is the cholesterol house of cards finally about to fall? Iodine of sea weed protecting them? There is a hypothesis on almost every vitamin, foodstuff and mineral….and CHD. I could find five hundred on a good morning. I feel I must add, if you have read anything of what I write, cholesterol has no influence on CHD. Yes there are many. And I have read your book and and am not opposing it. I thank you for your writings. Dr Kendrick, I think it is especially kind of you to write such essays as this, and for free on your blog. I am retired, but now spend much time working at home, hopefully, being a good housewife, as I ever did working for a living. I just could never find the time to research and read the stuff you so generously give us. I am sure I speak for many. Thanks Dr. Kendrick, some of your posts should come with a health warning, especially for me. It’s great to see all the stats showing higher cholesterol associated with a lower mortality risk but spare a thought for people like me who have naturally very low cholesterol, off the lower end of the scale in my case. There is no shortage of advice on how to reduce your cholesterol by natural means but how does one raise it without giving up red wine, that is. Please turn your attention to us poor souls in future posts! Stuart, the increased risk is, in reality, very small. I am mainly trying to make the point that LDL/cholesterol has very little do with health (except at the very extreme ends). It is just a thing, like being six feet two, rather than five foot six. I would no more advice to you chop your legs off, of stretch yourself, than worry too much about cholesterol. But the other side have got everyone so panicked that I feel I have a duty to redress the balance. Thanks for that, as I also have low cholesterol (everything is low, total, LDL, HDL, etc.). (Although my former primary physician wanted me put on a statin; I say “former” because there’s no way I’m going on a statin and therefore no way I’ll see that physician again.) I’ll be interested to see what happens when I get a blood test done this year. Though I’m not sure any of these values matter, I have been on a low carb diet for over a year now. I assume something has happened to my values. I’m more interested in my blood glucose and insulin values than lipoprotein values. After reading your book a couple of years ago, I took myself off statins (Simvastatin) and felt hugely better for doing so. 2 months ago I had a stroke – cholesterol 8.3 – and so I was pushed into taking statins again (Atorvastatin 80mg now reduced to 40mg as I got my level down to 3.2 in 6 weeks – I’m still on the statin). I am in my early 50s and had led a very sedentary life – long hours sitting in front of a computer. At the time of my stroke my BP was very high, but more importantly in my view, my stress levels were pretty elevated. I have read lots of articles about the cholesterol myth and am persuaded that statins are generally unhelpful but I’m confused about my own situation as the consultants firmly blame my raised cholesterol for the stroke. I really wish GPs (and insurance companies) could be persuaded on this issue. Stuart, I am just reading this new blog of Dr. Kendrick’s. Dr. Mercola who is basically an expert in nutrition among other things has an inherently low level of cholesterol. You may want to access some of his blogs or go to YouTube to see if you can find out more information. He appears to be in the best of health and actually states he has to eat a certain way to help raise his cholesterol levels. I think he would be a great reference for you if you are concerned. I would not worry if you are healthy in general, but it can’t hurt to find out from an expert on health and nutrition. Good Luck! If cholesterol doesn’t cause atherosclerosis and I don’t think it does, what does cause it? Sugar and too many carbs I believe I read some where recently. Roy, that was my first question two years ago when someone referred me to Spacedoc.net. I had been on statins for years and was in so much pain, I felt hopeless. But, I could not accept some doctor telling me that I had a back injury and that was why my legs ached 24/7. I was placed on cholesterol lowering drugs, B/P meds, and Plavix (for a short time). I read three of Dr. Graveline’s books. Dr. Kendrick had written the intro to one of the books and I bought his first book, The Great Cholesterol Con. After that, I was told to get a copy of Statin Nation. These were difficult concepts for me. I did not understand heart and vascular disease from anyone else except the doctors who had treated my late husband. Those doctors were just fixing plumbing problems. They did not explain a damn thing to me except to say that heart disease was caused by cholesterol blocking our arteries. I just accepted their word as gospel and did what I was told to do like the good Catholic girl I was. I also had been diagnosed with an abdominal aortic blockage, which had been stented. I had no heaviness in my legs any longer, but the pain was still awful. I was a woman on a mission for years to find out why I still ached so much, had spasms, began to have one leg just give out (not enough to fall but enough to make me concerned). I read those books with gusto. I highlighted and read again and again those parts I found troublesome. I reviewed Statin Nation over and over again, making notes for myself and particularly listening to the extended interview sections. Whenever I would not understand one of my notes, I researched certain medical terminology and began to get a very clear picture of what atherosclerosis really was and how for years on end we had been led to believe it was fat (saturated) and foods containing cholesterol that were killing us and causing heart disease. I had friends who had not touched an egg yolk in years. That is how duped we were into believing cholesterol, even in the diet, was the number one cause of heart disease. It was the old dusty diet heart hypothesis. I had actually tried a diet that consisted of moderate fat intake, low glycemic foods and vegetables and that had worked for me for years. I would strongly suggest that you purchase Statin Nation, review Spacedoc.net, and later Statin Nation II. Don’t get too bogged down. It is a very complicated subject. But you will learn. It will not be overnight, but you will one day have that Ah Ha moment that will change your life. I ditched those statins by the way and really don’t care what my cholesterol levels are. They were good numbers when I was diagnosed with a blockage. Start there and whatever you don’t understand…look it up. Even if you have to read it 10 times to understand…do it. I find that Dr. Natasha Campbell McBride explains the whole process as though she were teaching a 6th grade class. That was very helpful. The rest will fall into place. Kendrick, Graveline and Uffe Ravnskov stand out in my mind (and I speak only for myself) as the Founding Fathers of the dismantling of the Diet Heart hypothesis. They took years of their precious time to research this issue not for love of money but because they loved medicine and helping others. They, among others, have faced so much backlash from the establishment, but bravely did what they knew was the right thing. You cannot expect yourself to learn it in one blog. Go for it. You will not be sorry!!! Refined foods and the animals we eat that eat refined foods. Add in the man made chemicals we allow to be sprayed on our foods. ALL these things have side effects for the plant or animal who eats them (This is basic quantum mechanics). And this includes us. Bless you Kendrick – a breath of fresh air and sanity in a very strange pharma led world ! Good job man. I feel sure the tide must be slowly turning on statins. However, the cynical part of me, can’t help wonder how long it will be before research (with a vested interest) shows that the Japanese have some genetic disposition to high cholesterol, or find some other way of discrediting the research. This latest posting has cheered me so much Dr. Kendrick. I stopped taking statins some months ago after following one of your earlier postings, but admit to wondering if I was “jumping the gun”. This latest information has reassured me that I did the right thing, after taking on board the advice that so many people were willing to give. Their experiences were a revelation to me at that time as so many of them mirrored my own. Thank you so much for continuing to care, and for passing on your findings as and when they happen. 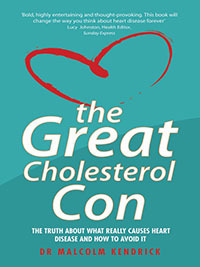 Dr Kendrick, I read your book, the Great Cholesterol Con, on the recommendation of Dr Barry Peatfield a few years ago. Immediately afterwards I gave a copy to an elderly relative, who is a retired academic with an analytical background. When his GP menaced him with a statin prescription, he was prepared and he refused it successfully. For my own part, I felt very angry that for more than 30 years I had followed the recommended high-carb, low fat, near-vegetarian diet, only to end up overweight and insulin-resistant. What a waste, and what a bloody boring diet. Your book and your blog have been very liberating. And, as you say, hats off to the Japanese! The tide may be turning at last. It worrys me because I try to be very low carb! The only thing I support is the best evidence. At present Weston A Price are doing most of the right things, as far as I can tell. Is there anything that the Weston A Price Foundation does that you would advise against? Tricky to answer. That would require me to read everything, in detail. A trap waiting to happen. Justin, I changed to a low card diet three months ago and the article doesn’t worry me at all. The author clearly accepts the ‘standard’ thinking that high cholesterol is harmful. Dr Kendrick’s comments and the Japanese article refute that position completely. Low carb has been good for me and there’s no reason for you to doubt it. Earlier today I came across this excellent Ted-x talk by a diabetic professor of biochemistry called Wendy Pogozelski. Based on her knowledge of biochemistry she went on a low carb diet and successfully dealt with her diabetes. She was then referred to a dietician who was predictably appalled. I think people interested in diet or diabetes will find the professor’s experience and short talk enlightening. You might scroll DietDoctor on this issue. I am myself on strict LCHF since six years now and would never wonder about my cholesterol levels. To me it is just big money and sheer stupidness involved from the beginning as the Japanese indicate. Another encouraging post Dr K. I wonder if Big Pharma & the Statinators are huddled round the table biting their nails and wondering how to get out of this one? As Nigella suggested, they’re bound to find a ‘reason’ for such damaging (to their hypothesis) information. Their whole world is at stake – and their bank balance of course. They will simply ignore it. A technique that has worked well for them over the years. They are probably all huddled in a bunker with the endocrinologists ignoring the thyroid research. They probably all get on very well! Keep chipping away at their hypothesis and who knows…..someday! I am not a doctor, but it seems likely that you are right: high cholesterol is associated with lower all-cause mortality. But before we get excited about this, we might want to ask how strong the association appears to be. We might also want to know if steps to increase cholesterol–other than discontinuing statins–would be expected to increase longevity. Personally, I’ve been amused that my doctors seem to focus on lowering risk of heart disease (especially with statins) while ignoring the fact that even those with a higher risk of heart disease are likely to die of something else (we, thankfully, don’t know what). 1) There isn’t much/any correlation between saturated fat intake and cholesterol in the blood. Saturated fat is actually good for you! 2) There isn’t much/any correlation between cholesterol in the blood (or LDL in the blood, or LDL/HDL) and heart disease. 3) There is evidence that lots of carbohydrates mean lots of glucose in the blood – because that is what they break down into – so encouraging diabetics to eat more carbs is criminal! 4) Statins cause extra diabetes as well as what are euphemistically called ‘muscle pains’ (some people end up in wheel chairs) and memory loss for some. Taken all together, this is an unbelievable scandal. I don’t take statins any more, and I don’t even have my blood cholesterol levels measured. I am in the middle of reading the absorbing book by Prof Peter C Gotzsche – “Deadly Medicines and Organised Crime – how big pharma has corrupted healthcare”. What an eye opener. Afraid that they could `ignore` the findings, or, find a crutch in the shape of different genetics, even diet perhaps, to continue to hang their lies from. But the whole fabricated tissue cannot go on forever, the rug is slowly but inevitably being pulled from under their disgraceful machinations. More power to Dr K and to the Prof. Sigh of relief that we have such bold excellence to call on. As “Doctoring Data” Prof Peter C Gotzsche – “Deadly Medicines and Organised Crime – how big pharma has corrupted healthcare” is really great reading. You are not the same person anymore in relation to the healthcare when you have read these books. Must find a way of sending the info to Prof Gotzsche – think he would be amused at their further shannanigans. A careful listen and will note the *new wriggling… They are beginning to wriggle now…”Too high intensity statins” “Too much emphasis on LDL / HDL numbers” “Lipids – overestimate risk” I love it. Ohhhh – they are admitting they must “change their guidelines – potential risks – `shared` decision making” !! What a turnaround… “Get patients more involved in their own conditions and treatments…” HaHa Pharma sure is seeing the statins rug being pulled from under their feet ! Well, let us just `hope` that NICE will change their guidelines and *STOP stuffing statins at us and *stop badgering GPs to hand out the Rx for em. It’s not just the cholesterol house of cards that is falling but the whole ‘saturated fat will kill you’ bandwagon too; http://fitteru.us/2015/05/earth-shattering-pigs-flying-hell-freezing-nutrition-news/. Sally, thank you for the great link to the article and Sarah Hallberg’s Ted talk. You’re most welcome Stephen. Her talk is invaluable for diabetics, and all those wanting to avoid it! Thank you for the interesting info Dr. Such a relief to get this positive info. Just wish other Dr. would make time to educate themselves or at least keep pace with changing times. My Dr. wanted to put me on Statins a month ago, but I insisted on a LDL particle test. Thanks to you and other Physicians on the subject matter I was able to educate myself on Cholesterol. Otherwise I would be another sucker to contribute to the Pharma coffers at the expense of my health. Hi, I was diagnosed with familial hypercholesterolemia a couple of years ago. I do take stations, as I’m afraid not to! What are your thoughts on this issue please? Thank you. In addition to ‘Big Pharma’ and the ‘healthy’ ‘better-than-butter’ spreads/foodstuff manufacturers, may I add the holiday insurance industry, which exploits the prevailing consensus that hypercholesterolaemia is a disease and an additional source of income to swell their obscene profits, and a godsend to their bottom-line. That I should continue being prescribed for hypercholesterolaemia and alleged raised BP and then, Heaven forfend, dumping the dreaded pills in the waste bin, just so as I can continue to get insured for my Spanish holiday. Who me? Whatever gave you that idea! Leigh, I declined blood pressure medication. How does that affect my holiday insurance? Any advice? Don’t decline your medication. I’d imagine that your refusal would show on your records and, in the event of an insurance claim, it could compromise your position. Declining medication is one thing. Receiving medication and not taking it is another. It has been said that simplicity is the ultimate sophistication, so contact your travel insurance company and ask them. But don’t expect a favourable reply. I was born with natural high cholesterol. I was on statins for a while but they screwed up my blood sugars. They went from 85 fasting to 100 and they have not yet come down. Every time I walk into the doctor’s office there’s a red label on my chart that says HYPERCHOLESTEROLEMIA and now they have added PREDIABETIC. At what age is “elderly” ? What does it vary on ? I’m 62. I don’t feel ‘elderly’ but would my cholesterol level consider me ‘elderly’, if you see what I mean, because saying a higher cholesterol level is protective in the elderly surely depends on what it means to be elderly. Btw, I’m not worried about my cholesterol levels ! I’m just trying to be a bit scientific here about the phrase protective in the ‘elderly’. Where A is your present age! Interesting question: At 81+ the old muscles are wobbly which statins probably contributed but I DO NOT FEEL OLD. The brain is a bit slow (statins again???) but still packed with a lot info and my computer storage helps as well. I think one is as old as one feels – don’t bother about numbers in this case. I read that before the age of 50 there is a weak association between high cholesterol and heart attack, but after 50 it disappears. Good to see the contradictions in the cholesterol hypothesis challenged in ‘real’ population data. One question: what’s the difference between hypercholesterolemia and ‘naturally’ high cholesterol? Could it be some people are told they could hypercholesterolemic but are actually meant to have higher than average cholesterol? I understand that some unfortunate people do have damaging genetic cholesterol problems but have heard of experiences when this ‘diagnosis’ is used to frighten one into statins even before any tests for the condition has taken place. Yes, Lorna. Then ‘average’ becomes ‘normal’…..and that is what starts the ball rolling for the pharmaceutical industry……who interpret this to mean we are deficient or in excess of something or other, so must take a pill to ‘normalise’ us. In the world of arithmatic, only a precious few of us can possibly be normal, that’s the way ‘average’ works( or so I learned at junior school)…..thus that lucrative majority on either side will fall into the catergory of needing a pill or potion ….CHING CHING. The world that we live in at the moment is all about control !! too many sheep in the world !! STATINS CREATE BILLIONS IS ALL ABOUT THE DOLLAR ! WHO CARES ABOUT THE SHEEP !! Just thought you may like the above link. How very true. It seems that US “democracy” is government by corporations such as the “security-industrial complex, defence industrial complex, health industrial (pharmaceutical) complex and others. Frightening. Same in UK I suspect! My husband’s cholesterol were all “within normal limits”, yet he died at the age of 50, from coronary occlusion, all were 90-95% occluded. A few years ago, my cholesterol levels were “high” and the doc wanted to immediately start statins. I said no. My Vitamin D level was 18. I started taking Vit D3 5000-10000iu/day and B complex, and a multivitamin and 5 months later my cholesterol was “normal”. Who was it that said let you food be your medicine and your medicine be your food? I’m so grateful to Gary Fettke -No Fructose for providing the link. My total cholesterol (both LDL and HDL) have increased on a low carb diet with intermittent fasting. And as the good doctor says, it is ok. We are looking at the wrong thing where heart disease is concerned. There is good evidence that high insulin is a possible culprit. And yet even though we have all the warnings of giving statin meds to the elderly, a UK tabloid (Daily Express) carries a front page story today extolling the 30% reduction in stroke benefits to that very same age category of patients’ (>75s). The Daily Express has considerable form when it comes to such front page stories (I guess it helps to sell papers) but it’s still very sad that no attempt is made to balance such a story in any meaningful way. It’s also a shame that no attempt is hardly ever made to explain the NNtT / harm or indeed how the meaningless relative reduction percentages are calculated. Contrast this to the vicious attacks on a programme such as that of the Australian Catalyst variety for its “lack of balance”. Great news. I stopped takin statins after trying 3 different brands that made me ill and in physical pain. Since I’ve stopped feel so much better. I also believe that the exceptionally bad treatment recieved by Thyroid patients contributes to them being given statins that they do not need (together with lots of other unneccesary medication). This is also driven by pharmaceutical companies and the medical professions unwillingness to listen to their patients and treat accordingly. My total cholesterol is 3.9. Does this mean I’m at risk of falling off my perch ahead of time? How low is too low? Not medicated, but has come down steadily since following Harcombe diet. On meds for BP. Should I be concerned? I don’t think so. Ask Zoe on her blog. Having read your book and several of your online articles, and being quite opposed to taking statins, I’d like you view on my husband’s situation. He’s in his early 50’s, extremely fit, regular exercise, good diet, cholesterol of 4 at the moment (historically he;s been around the 4.5-5.5 mark). During a company medical he experience a significant S-T depression during the 5th stage of the Bruce protocol – he had no symptoms whatsoever and was happy to keep going. He has never had chest pains, breathlessness etc. A CT angiography suggests coronary artery disease with a calcium score in the 50 to 75th percentile for his age. The recommendation is 40mg statins. We would very much like to know what your thoughts are on this, and your reasoning. I am going to say what I say to anyone asking for patient specific advice on this blog. I cannot do this. Even if I wanted to, I would lose my license to practice medicine very rapidly. Thank you for your reply. I appreciate your situation and should have thought of that before I asked the question. To me there is an elephant in the heart health room. It is one thing to change to a LCHF or Paleo or similar diet to improve one’s heart health risk, this research just adds to that need for such change, and so improve one’s metabolic syndrome risk. The question that must asked. Will this repair change the damage (plaque etc.) and over what period? What about 20 years of statins, will the damage be repaired by changing to LCHF and stopping statins? In my view, for many this is the real issue, and I perceive what may be in Maggie’s mind. Below a total cholesterol of around 3.5mmol/l I would be getting concerned. Good question, Robert Lipp, and one which is definitely in our minds. We’ve been told repeatedly that once arteries are ‘furred up’, that’s it without some form of medical intervention. As Dr Kendrick says, he can’t risk his license to answer internet questions, but if you read his books you will realise that he doesn’t believe there is any value in taking a statin if you haven’t had a heart attack or stroke, and only minimal value if you have. I was on 40 mg of Simvastatin (the dose varies depending on the type of statin), and all went well for 3 years before I got extreme cramps in one leg (which made it look like another problem), and I really only escaped because I remembered the list of side effects from 3 years earlier (how nerdy is that!) and stopped. I recovered completely, but *not everyone does recover*. I have talked to others of my age who have had similar problems, and one whose muscle cramps were combined with severe memory problems. Fortunately he has also recovered completely after giving statins up. I think the best advice would be to read “The Great Cholesterol Con” and make your own minds up. I’m glad that you have recovered and are feeling well. We have read Dr Kendrick’s book and my husband was quite firm in his view that he shouldn’t take statins, but when a medical professional makes a strong case for taking them, it becomes difficult. The argument goes along the lines that due to my husband’s age, fitness levels and so forth, there must be an underlying reason why he has developed coronary artery disease and, therefore, statins are the only way to slow down the development of plaque and to prevent fissures which can cause blood clots and possible death. Interviews like that can be difficult, I know. My usual doctor knows what happened when Simvastatin, and hasn’t tried to persuade me to try another statin. However, one time I went, I saw a different doctor in the practice, and when I had finished explaining my experience with Simvastatin, and the concept that saturated fat was good for me (so I wasn’t trying to keep my fat intake down) she seemed a bit bemused! I suggest that you should maybe get the paperback version of “The Great Cholesterol Con” so you can highlight various passages – particularly those parts that deal with actual trials – and you can lend (or even give) the doctor the book – which may make it easier to say “No”. Also discuss the concept of Number Needed to Treat with him (http://www.thennt.com/nnt/statins-for-heart-disease-prevention-without-prior-heart-disease/ ). These are numbers calculated from the actual trials performed. I think you can find similar sections on that site for the other major statin drugs. Ultimately, I think you have to do as I did, and breath deeply and say that nobody lives forever, and if you take something that messes up whatever time you do have, that is a rotten deal. Thank you for your post and the links. I’ll take a look at them, and also forward them on to my husband. 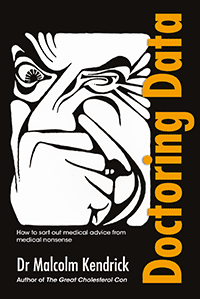 Your suggestion about taking Dr K’s book to a future appointment is sensible, but likely to be given short shrift if my experience is anything to go by. A few years ago I took a book regarding thyroid treatments along with a number of questions to an appointment. The doctor was incredibly dismissive and refused to discuss it, branding the authors quacks (they were all practicing doctors). She also warned me of the ‘perils’ of looking at the internet, although I was referring to published BMJ articles amongst others! This is important, and goes against accepted health advice, which, it seems to me, increasingly about profit, not health. Dr Kendrick, please can you tell me the names of the first and second authors, and/or the title, of the article that you’re citing in Ann Nutr Metabol. I want to read it, but the search engines available to me (Pubmed and Google Scholar) haven’t found it from the journal name only. I have also checked the contents list of the latest issue online but not spotted it. Thank you. Oops! just spotted the DOI. I have found it now. Sorry to bother you. Can you possibly answer my question about the Weston A Price Foundation when you have the time? Thanks again doctor! Context please Justin? What do you mean doctor? People ask questions for reasons. That is context. Frankly, I am not here to answer any question people decide to lob at me. I just write a blog, I am not, actually, a paid state employee. I understand! You don’t have to answer questions which you don’t want to or have time to? Is this what you mean? I am a State Employe. I get to working so hard but it’s worth it! More or less I just meant if you disagreed on their certain guidelines, absolute use with fermented cod liver oil and high vitamin butter oil, use of organ meats or fatty cuts of meat with muscle meat. Questions like that! Where is your thread leading us? I think you should use a different blog to research your queries, if, in fact you genuinely have some. Or is your aim to cause embarrassment? In the main, subscribers tend to use this blog as an informative, positive and non-combatative resource. Thanks Stephen, your link works, I was being dumb, had not spotted that Dr K provided the DOI. I have the article niow. Thanks for the link Stephen ! I’m now reading it….most interesting. So a new question arises: it is not clear whether the LDL levels were direct measurements of LDL, which hardly anyone in the UK is able to have, or whether they were calculated by the Friedewald formula. I think the suggestion is that it is the Friedewald LDL. This makes a huge difference for those of us who have low triglycerides and high HDL as the Friedewald formula gives an inaccurate LDL measurement in that case ! So……..
Got to pubmed and enter “Ann Nutr Metab 2015;66(suppl 4):1–116 DOI: 10.1159/000381654. I have just downloaded the entire paper! I seem to recall Uffe (the Ravnskov) reporting on the longevity value of high cholesterol in at least one of his publications. Did he not do a meta-review of studies to arrive at his conclusion? But beware the following extract is a very truthful assessment: We believe the answer is very simple: for the side defending this so-called cholesterol theory, the amount of money at stake is too much to lose the fight. When money is at stake the losers are very dangerous! I am so happy to read that news. I have resisted taking stating for years…..mine is 260. It is one thing to change to a LCHF or Paleo or similar diet to improve one’s heart health risk, this research just adds to that need for such change, and so improve one’s metabolic syndrome risk. The question that must asked. Will this change repair the damage (plaque in the arteries, arterial elasticity, etc.) and over what period? In addition, what about the damage caused by 20 years of statins, is this repaired by changing to LCHF and stopping statins? In my view, for many this is or will become the real issue. A touchy subject. Time for some new information. Well thanks Malcolm! For years I thought the only health statistic I possessed which seemed beneficial was my naturally low cholesterol level ( cholesterol 3.1 mmol/L and triglycerides 1.08 mmol/l) but it now it would appear that I’ve been dealt a dud card on that as well! I have essential high blood pressure (reasonably controlled with drugs) and I have multiple sclerosis. So it would now seem that if I don’t die early from the HBP or the MS, I’ll probably die from my low cholesterol levels! What a swizz! Incidently, what will be the cause of death from my low cholesterol? Very interesting comments on here. I would like to add my experience. I am a 54 year old male in reasonably good condition. A couple of years ago I went for a routine medical check where it was discovered that I had raised blood pressure and ‘high’ cholesterol levels. Mass panic ensued and I was immediately, without consultation, handed a prescription for 40mg Atorvastatin and 10mg Amlodopine. I obediently accepted my treatment and sure enough, mild headaches, achy muscles and a general feeling of being ‘detached from reality’ followed. A friend of mine put me onto Dr Kendrick’s book The Great Cholesterol Con and after reading the first few chapters I decided to stop taking the statins. I accepted the importance of the hypertension medication so continued with that. On a subsequent visit to my GP for a BP check, I was asked if I was still taking the statins. My response of “no, because I have done some research” was met with a shrug of shoulders and “ok”. No argument or attempt to persuade me back on to them. I got a very similar response form another GP at the same practice when the subject of statins came up at a more recent visit. Is it possible that more practitioners are changing their opinions on the cholesterol/statin subject? I would like to know if statin therapy is a must for heart bypass patient. ?I have 3x cabg 1 yr ago, because I can’t tolerate statin, I took off the stay in therapy n go on with ezetimbe. I was worried as my Dr say that statin is a must for all heart bypass patient. I have just finished your book and had decided to stop taking my daily 10mg of simvastatin until I got to near the end when I read just one sentence which made me pause again. All the research data you referenced convinced me that I should cease taking a statin UNTIL you said that for “secondary prevention” taking a statin was beneficial. In other words [I hope I understood correctly], if someone already has CHD, the research indicates to continue taking a statin. Have I understood correctly? If so, why should this be? If the cholesterol hypothesis is not directly causal/relevant to CHD, why should it be beneficial to take a statin in this one particular circumstance? 5. present LDL 2.9 mmol/L. HDL ratio 2.4. 6. medication— aspirin, simvastatin, atenolol, ezetrol. I was also puzzled by one apparent anomaly in the final chapter. Your conclusion that CHD was stress triggered is convincing in that the damage to the arterial wall is related to cortisol and the subsequent “repair” by the body and consequent “covering” by cholesterol creates the thickening which builds to a fatal level by the continued stress triggered identical process repeating. Why should this blood vessel damage/repair/damage/repair cycle not occur in veins as well as arteries? I noted earlier in the book that this plaque build up ONLY occurs in arteries and not veins yet later you describe arteries and veins being essentially the same composition except that arteries are thicker but that if they are transposed, each gradually changes to become the other. ie. if a vein is used as an artery graft it’s walls will thicken in time and function as an artery and perhaps become susceptible to plaque build up. If stress related cortisol damages the internal wall of an artery, why doesn’t it do the same to a vein if the internal wall structure & composition is the same as an artery? I’m not medically trained or trying to throw a spanner—I just couldn’t understand the logic of the situation I’ve just described—-maybe I’m dumb or missed something. I am very cautious about statins also. But I would also caution about refined sugars and carbs as the sole cause of heart disease by reminding that artheroscleosis has been found in ancient mummies recovered from populations that had no access to either sugar or refined carbs. Eskimo populations that at a very fatty meat and fish based diet for example. My understanding is that the ancient Egyptians (before they became mummies) ate a high carb diet and were riddled with what we now know as lifestyle disease. I think the reference is in one of Gary Taubes’ books, if my memory is correct. True, but mummies from other cultures, high fat and low carb show exactly the same thing. Q: Why do you and your colleagues believe in Vitamin K2? A: The evidence is overwhelming. On one hand, you have the health benefits confirmed by many clinical trials. At the same time, we recognize Vitamin K2 is the compound missing in Western society – one in which most Western populations are deficient. Q: Who will benefit from taking Vitamin K2? A: Anyone interested in supporting healthy bones and their cardiovascular system will benefit from taking Vitamin K2. And, in truth, unless you are eating natto every day, you are woefully deficient in Vitamin K2, so start today. Q: As a doctor and scientist, what health areas/studies/issues interest you? A: My main scientific interest is inflammation and modulation of inflammatory disorders. Recently we found that vitamin K2 is able to inhibit inflammatory markers, which is important for many diseases.